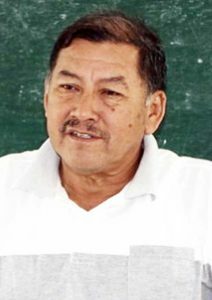 The Rukumuta and Tiperu villages in the Karasabai sub-District, Region 9 (Upper Takutu-Upper Essequibo) now have an All-Terrain Vehicle (ATV) to aid the day-to-day operations of the Village Councils (VCs). These remote communities are located in the South Pakarima Mountains and are accessed by rocky trails, hence the ATVs are best suited for the Toshaos and Councillors to travel to Karasabai during emergency cases, to conduct business and attend workshops and meetings. Minister of Indigenious Peoples’ Affairs, Sydney Allicock handed over the vehicles during an outreach to the area on Friday. He was accompanied by Legal Advisor of the Ministry, David James, Special Advisor on Projects, Martin Chung and other senior regional officials. At a community meeting held at Rukumuta, Minister Allicock stressed the importance of proper maintenance of the community assets and the need to ensure all of the residents benefit from its use. He added that the vehicles are not exclusive to the village council and recommended that a system be put in place where residents can use it at a cost. This, he said, will generate income that will be used to maintain the ATVs. Deputy Toshao of Rukumuta Village, Kim Binto, expressed gratitude to the APNU +AFC Government for the transport vehicle. He said that transportation is a major issue for his village, and so, the ATV will bring some ease to the residents. Over at Tiperu, the ATV will add to the tractor and trailer the community already has to aid their agriculture drive. “This vehicle will be very useful for us here. It is faster to get down to Karasabai to meet my CDO (Community Development Officer) and my DDO (District development Officer) during emergency calls and so on,” Toshao Dilbert Albert explained. He said that his Village Council will ensure the vehicle is properly maintained and benefits all the villagers. 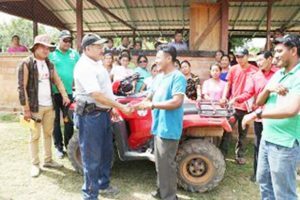 Last month, the communities of Aranaputa, St. Ignatius and Sarariwarau, Region 9, received tractors and trailers each to boost their agriculture initiatives. Under the ministry’s 2019 capital programme, the sum of $64.7M was allocated in the National Budget to purchase boats and engines, ATVs, buses, tractors and trailers and off-road vehicles for hinterland communities. over one of the ATVs to Toshao Dilbert Albert at Tiperu.